People, I am really looking forward to The Rapture. One of the reasons would be that I think I’m pretty much guaranteed a slot, not because I’m particularly religious but because I’m a pretty neat guy and most people like me, and that would include God who simply loves me. Well, He loves you to but I’m thinking He might love me just a little bit more. Besides, if I don’t have a slot secured when The Rapture occurs that would mean that I’m going to be Left Behind and if I am Left Behind then that would mean that I will be stuck on the planet Earth watching movies such as this one ‘2012 Doomsday’ from our friends at The Asylum and their Faith Films wing. Thus that would mean that God doesn’t love me at all and in fact hates me. And though it is true that our God at times can be a vengeful God, I don’t think He’d do me like that. 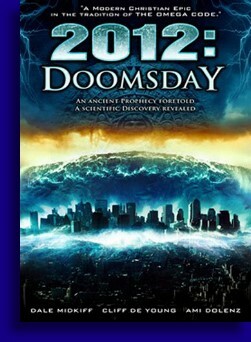 The year is 2012… duh… and it’s 36 hours before DOOMSDAY!!!! Super jungle doctor Frank Richards (Dale Midkiff) has made the discovery of a lifetime, a gold crucifix in a cave that proves once and for all that Christians were in North America before Columbus. I don’t think anybody actually cared about this. That being said he’s gone and debunked the myth anyway. While Doc is making this amazing discovery all kinds of bad things are happening on planet earth, just like the Mayans said it would, which has about fifteen people on the planet earth in quite a tizzy. The earth, you see, is slowing on its axis and is about to come to a screeching halt which you might think could have some seriously catastrophic effects, such as the end of days, but instead will mainly flood the west coast. What was cool is that the West Coast of all the Americas is about to be flooded in twelve hours or so and the president has ordered the evacuation of the entire west coast of the United States, we’re talking almost all the way into Oklahoma and comprises a good fifty million. Damn if the evac doesn’t go off without a hitch. Smoothness! Anyway there’s some stuff going on with these fifteen people such as Lloyd (Cliff DeYoung) the doomsday bureaucrat who who’s trying to convince his silly daughter Sarah (Danae Nason) to leave Mexico because Mexico has a west coast too. But Sarah has to make it to the pyramid where Doc found the crucifix because God told her she had to be there to help Wakanna (Sarah Tomko) deliver her baby. I can’t remember if it’s a virgin birth or not. There’s also Susan who doesn’t believe in God because she sees people die all the time in her job as EMS tech but is going to this pyramid too, with her devout mother, because the God she doesn’t believe in is telling her to go. What does it all mean? What are all these people doing at this pyramid? What does this have to do with the Mayans? Why does the God in this movie hate Black people and Asians, just to name a few ethnic groups who were not chosen? Who knew that the pyramid of The Chosen would be governed by Jim Crow laws? All of these questions and more will NOT be answered anytime soon my friends. Far be it from me to crap on a movie that has a message of faith, belief and a love of The Lord but whatever one’s movie happens to be about it still has to find a way to be entertaining. Uh… no. You will have to look far and wide to find a movie as boring, slow and as disconnected as writer / director Nick Everhart’s ‘2012: Doomsday’. For a movie to have a subject matter that is as fascinating as the end of the world and yet somehow have its audience sit in its seat slack jawed at how mind numbingly slow it moves is in itself some sort of accomplishment. But since this is a movie with a positive message buried underneath possibly the longest 80 minutes of anybody’s life, I will focus on the positives of this movie and that will be some of the amusing tidbits you will discover if you have watched or choose to watch this film. Take the scene where Dr. Frank deciphers the hieroglyphs telling him that a pregnant woman will appear to deliver her baby at the pyramid, yet when the pregnant woman shows up he asks her ‘What are you doing here?’ Hilarious. Dr. Frank’s ex girlfriend Dr. Trish (Caroline Amiquet) suddenly shows up but after a car accident starts to cough. Cough in real life, get a cough drop. Cough in a movie, YOU’RE GONNA DIE! Guaranteed. So God wants my girl to make it to the pyramid with this pregnant woman and to help her he impales the cat driving her to the pyramid with the worlds most lethal hail rock. Awesome. God was probably just upset that this idiot was swerving across the road in his SUV trying to dodge falling hail. Man I’m glad everybody doesn’t do that. There’s more glorious and unexpected humor in ‘2012: Doomsday’ but because its so boring, so slow and so nonsensical you might not have the patience like I do, say the patience of Job to keep things on point, to unearth this glorious humor. So here I sit waiting for The Rapture to take me away.